Not a full review just yet as I am still reading my way through the book. I will do a full review when I've finished it. This is really just to say that it's the first book on buses that I've read which has actually had me laughing out loud. That's the result of the very many anecdotes and recollections from people involved in the process. As with most jobs there are good moments and bad moments where it's the people that shine. I'm not going to go overboard with references but one recollection that really made me laugh was about Docklands Minibuses when they were running against London Buses. Harry Blundred put a new chap in charge and he noticed that the recruitment process was not resulting in any black or Asian drivers working for Docklands. Given the demographic in East London he thought this was very odd. It later transpired that the person in charge of driver recruitment was a member of the Ku Klux Klan (outed by a national newspaper). He was sacked by the new boss. The book has some excellent insights to the various stages of LBL reorganisation and restructuring. It nicely describes how the tendering process worked in the early days and then developed. Despite remarks in another thread I am certainly not detecting any bias one way or the other about privatisation being deemed good or essential. What is clear is that a lot of things had to change to try to restore public confidence in the bus service and achieve better value for money. It's also clear that LRT pulled no punches in terms of dealing with the worst contractors when their performance was unacceptable. Several had clearly got their sums wrong or simply underestimated what's involved in running a London bus service. Others had done their sums properly and managed to carve out viable businesses that made money. As someone who worked through this period albeit in more junior roles and in LU and not Buses it is interesting to be reminded of some of the things I recall happening but didn't really understand why they were happening. It also seems in some respects London Buses were pretty lucky in the choice of some of the managers / top people they had at the time. It's certainly interesting to see names that are "big" these days and learning what they were given to do back then and how they must have developed their expertise from being given a freer rein than others might have had just a few years before. I'll come back and finish this review but even half way through the book I'd say it was highly recommended, a good read and if you're genuninely interested in those times then it's worth the money. I've read sections of this book that are of interest to me and it is very interesting. I would like to read the whole book but at the moment I don't have time and it depends if my dad has them in stock because of the price and specialised subject doesn't appeal to every London enthusiast and sales have been slow compared to other books that have came out lately. For me, the only thing stopping me from buying it is the price - I've already shelled out this week for two Matthew Wharmby books lol. Well having read the entire book I certainly won't change my view that I set out above. The section on how the actual privatisation process worked and who was involved was illuminating. I was certainly unaware of who had bid for certain companies. The reaction of particular people to the prospect of Stagecoach buying them was amazing and yet the reality was completely different as was discovered by Mssrs Bowker and Arnold who ran Stagecoach East London back then. They clearly all thought Mr Souter was the "axeman from hell" and yet he wasn't like that at all. I was particularly unaware that the pressures from venture capitalists to get their money back is the reason why so many companies were sold on to big concerns within 3-4 years. It makes perfect sense when you read about it but I wasn't aware at the time. There is also interesting discussion about the merits of deregulation, net cost contracts and the current regime we have now. The general view from people who commented is that London Buses succeeded in turning round an organisation that was beset with problems in the 70s and 80s. It is clear that drivers and engineering staff took the brunt of a significant worsening in terms and conditions over many years but jobs were retained in many cases. Some also gained from privatisation where there were management buy outs with staff being given shares or the opportunity to save for them on a regular basis. When the firms were bought out they got a slice of money. There are some surprising comments about whether privatisation was necessary to achieve an improvement in performance - won't say any more as that would spoilt it. There's an acknowledgement that more money was needed to bolster quality and increase wages in the late 90s because there were staffing problems resulting from growth elsewhere in the economy. The book ends by summarising that today's network with its much denser network and higher service levels grew out of the changes through the 80s and 90s where cost cutting allowed LT to introduce new services which have grown to be successes now. Overall a very good book on London Buses. One of the most enjoyable books I've read on the topic and possibly the only book on buses that has made me laugh out loud because of the stories and anecdotes. Sounds like you enjoyed it. Was it worth £35:00? On balance yes. It was particularly interesting to learn more about and be reminded of the Walthamstow strike. I remember that happening and all the chaos we had but there were aspects that I didn't know about - such as Kentish Bus running on the 56. Not everyone will have that sort of direct memory to be triggered by the book but it does cover the changes London wide so I suspect most enthusiasts would find something of interest in the book. The cost is pretty high but as I hadn't bought a book or a CD in several years I felt I could treat myself even though I am careful about discretionary spending. Just got my copy through the post and very excited about reading it over the weekend. As a teenager with friends at Barking Garage when Tendering started, I knew there was a good story to be told. I wonder whether there will be a mention for BK crews booing Ensignbuses as they trundled past the garage on the 145. But in context, they are always well researched, well printed, and as they are aimed at a niche market, they won't have a large print run. Then you're going to love this ONE when it's published. I’d been after this book for a while but found £35 way too much regardless of how good the book was whilst there was one on eBay sitting there for £37 for months and months. A couple of weeks before Christmas, I finally found one going cheap at 99p bids so I watched it and bidded and eventually won it for £20 including P&P and better yet, condition was just about brand new - result! I just started reading and it’s very interesting so far. The East London bus scene in 1969 was one of contrast. This was London's industrial heartland with the River Thames bankside dominated by docks, power stations and heavy industry, including the massive Ford Motor Works at Dagenham. Inland, dense inner city housing gave way to terraces and vast council estates. 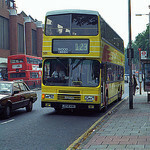 The red buses of London Transport held a monopoly relieved only by the Green Line coach routes also run by London Transport. However, in the outer reaches of the Greater London Council area there was a remarkable overlap as London TransportÂ’s red buses delved deep into Essex while the Eastern National buses from Essex ran deep into London Transport territory. Twenty years later, much had changed. The docks and power stations had closed and the London Docklands Development Corporation was transforming the old docks into Docklands. Changes in the bus industry saw London Transport split up in 1970, then from 1985 deregulation led to routes being tendered out and new operators taking them over.